Arrival in Sofia. 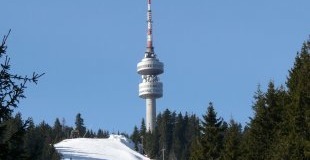 Sightseeing tour of Sofia. Visit to Alexander Nevski Cathedral - one of the largest Eastern Orthodox cathedrals in Europe, as well as one of Sofia's symbols and a primary tourist attraction; St. George Rotunda, St. Sofia Church, built by the Roman Emperor Justinian in the 6th century, National Theatre, former Royal Palace, Presidency, etc. Upon request - evening panoramic tour "Sofia by night" and dinner at a traditional restaurant with folklore music and dances. Overnight in Sofia. 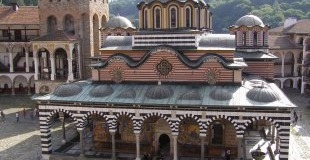 Departure for Rila Monastery - the most exquisite example of the monastery art and architecture in Bulgaria. Visit of Nativity of the Virgin Church with its miracle icon of the Virgin and splendid gilded iconostasis, the old kitchen, the museum, keeping the long and heroic history of the monastery and the unique wooden crosss made for a period of twelve years by monk Rafael, Hrelyo's Tower and many spectacular views of the mountain and the surrounding nature. Drive to Melnik - the smallest town in Bulgaria. Original medieval houses together with the ruins of a fortress are preserved here. The town is famous for its wine cellars producing the best red wine in the country. The nature around is picturesque and you can see the biggest rocky pyramids in Bulgaria. Upon request - wine tasting in Melnik. Visit to the 13th century Rozhen Monastery situated to the east of Melnik. The iconostasis, the wood-carvings and the miraculous icon of Virgin Mary in the monastery church are real masterpieces. Drive to the town of Bansko. Overnight in Bansko. Breakfast. 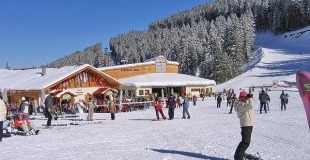 Sightseeing tour of Bansko - the most famous winter resort in Bulgaria, recently discovered by foreign tourists, provides an interesting combination between the virgin nature of Pirin Mountain and the atmosphere of that ancient Bulgarian small town. The area around Bansko is part of Pirin National Park - the largest one in Bulgaria with an area of 40 thousand hectares of which almost 3000 are a Reserve. It is included in the list of UNESCO. Drive to the villages of Leshten and Dolen. The area baring the authentic spirit of the past is quietly set in the very western highlands of the Rhodopes Mountains overlooking the Pirin Mountain, too. 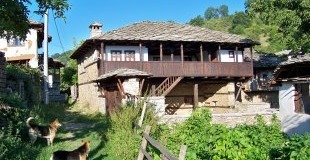 The houses in Leshten and Dolen are unique not only with their architectural style, but with their interior as well. Each house has its own spirit and the smell of wood can be felt everywhere. Visit to the old church in the village of Dolen, unique with its bells and murals. Departure for Smolyan. Overnight in Smolyan. Breakfast. Departure for Zlatograd. Sightseeing tour including a visit to the Ethnographical complex. Departure for Perperikon. Thousands of years ago, Perperikon was a massive bald rock. Such rocks drew prehistoric humans like a magnet and became an object of worship. This amazing structure was discovered and documented in April 2001. It is high in the mountain, in a wild, rocky area above the Borovitsa Chalet, some 14 miles from Kurdzali. Ruins from old prehistoric settlement, tombs, palace, city walls, temple - everything started its development some 5000 years ago. Drive to Plovdiv - European Capital of Culture. Plovdiv - the second largest city in Bulgaria - known as the old Trimontium. Walking tour in the Old Town including the 2nd century Roman Theatre with its majestic marble statues, decorative columns and arcades. The Theatre was build under the rule of the Roman emperor Trajan and is nowadays considered to be the largest surviving Roman construction in Bulgaria. Overnight in Plovdiv. Breakfast. Departure for the town of Kazanlak. 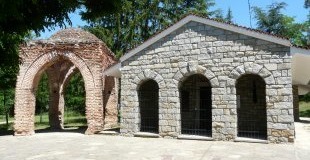 Sightseeing tour of Kazanlak - visit to the unique Thracian Tomb included in the UNESCO Wolrd Heritage List and dating back to the 4th century BC. Its murals and paintings are Bulgaria's best preserved artistic masterpieces from the Hellenistic period. The town is unique for its Rose Museum – the only one in the world. Drive through the Shipka Pass to the Ethnographical Open-Air Museum Etara, representing the Bulgarian customs, culture and craftsmanship. 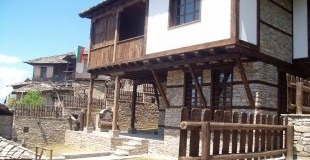 The park features typical Bulgarian Revival houses and the tourists are able to see how locals use original old instruments in crafts such as wood carving, pottery, coppersmith, needlework, etc. Drive to Veliko Tarnovo. Overnight. Breakfast. Sightseeing tour of Veliko Tarnovo - visit to the historical Tsarevets Hill, which served as a primary fortress of the capital town during the Second Bulgarian Kingdom. Drive to the village of Arbanassi, famous for its well preserved 17th and 18th century churches and the typical Revival architecture of its houses. Drive to Sofia. Overnight in Sofia. Breakfast. 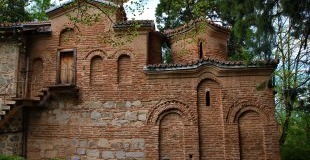 Visit of the medieval Boyana Church, included in the UNESCO World Heritage List. Transfer to the airport and departure.